In this economic crisis, people tend to trust the government for possible employment opportunities. Unfortunately, cyber criminals know this and use these circumstances by attacking job-related government sites. The collected email addresses are saved in a text file on the affected system and then sent to a remote “drop box” through FTP. This scheme is possibly an email-harvesting technique, wherein the collected email addresses will be used for future spam runs. TROJ_BANLOAD.JMO also connects to certain URLs to download malicious files detected as TSPY_BANKER.MOA and TSPY_BANKER.MOB. TSPY_BANKER variants are notorious info-stealers of banking-related information from affected systems. 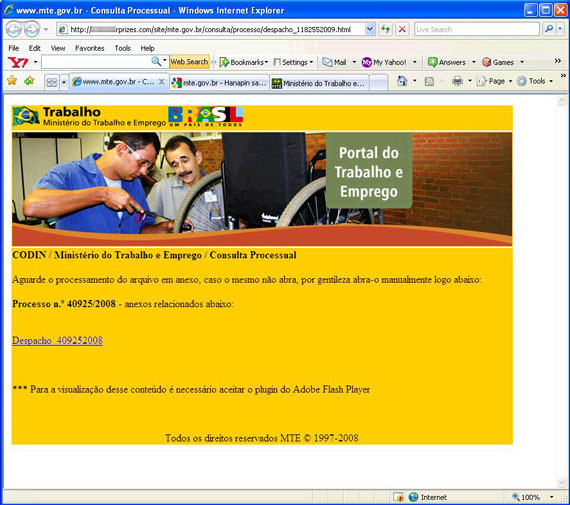 This attack places Brazilian job hunters at risk of getting their banking information stolen, which would only worsen the affected users’ current situation. The fake website, as well as malicious files, are now blocked and detected respectively by the Trend Micro Smart Protection Network.